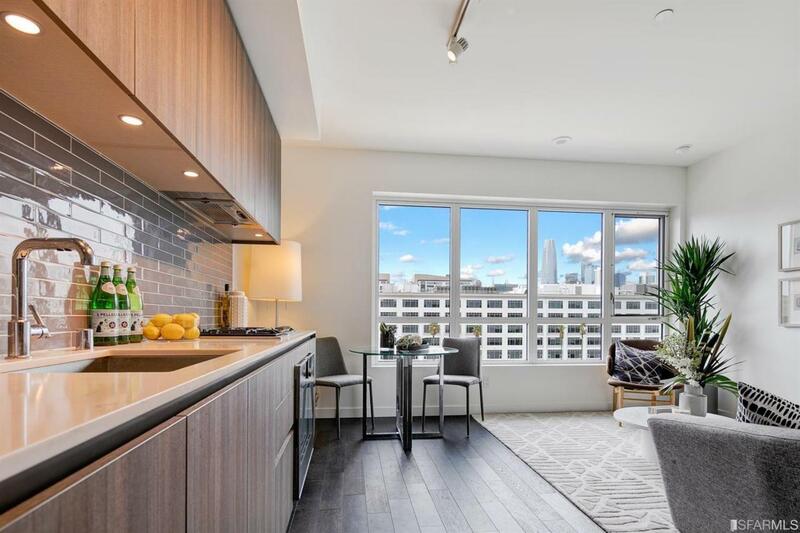 This well-appointed junior one bedroom in Mission Bay's newest building combines fine finishes with sweeping views of Mission Creek, Oracle Park, and partial Bay Bridge views. Hardwood floors throughout, large closets and galley kitchen with caesarstone countertops and high-end Gaggenau appliances. Central heat and air conditioning with an unit LG washer-dryer. Amenities include 24-hour doorman; outdoor heated pool, jacuzzi, grills and dining; fitness center and sauna; resident dining room, game room and catering kitchen; business center and library; dog wash; a reservable guest suite; and adjacent hotel and restaurant. Near gorgeous Mission Creek Park, the Embarcadero, and Potrero Hill. Excellent walking, transit and bike scores, plus easy access to the 280, 80 and Bay Bridge. Listing provided courtesy of Crystal C Injo of Compass.